At Brighton Hill Community School, we put learning and teaching at the heart of all that we do. As such, we believe that we have a key role in helping to train the next generation of teachers. We currently work with three excellent ITT providers: the Basingstoke Alliance SCITT, Reading University and the Learn Alliance. We are proud to offer an effective, comprehensive and supportive package to the trainee teachers that are placed with us. If you are thinking about training to teach and would like to find out more, we would welcome the opportunity to show you around Brighton Hill Community School to give you a feel for what life in a successful and thriving secondary school is like. 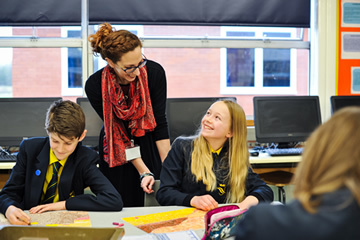 If you are interested in spending a day or more with us to gain a real insight into the world of teaching, feel free to contact us to arrange some School Experience Days. We will arrange for you to shadow some of our teachers in the faculty area that you are interested in and see what life in the classroom is really like. There will also be opportunities for you to meet staff with key roles and responsibilities within the school to develop your understanding of how schools work. We are proud to work with three ITT training providers who all offer excellent courses in training to teach. Click on their links below to find out more about what they have to offer to help you along your route into teaching. If you’re keen to learn more about training to teach, we’re keen to hear from you. Contact Mrs Sophie Hallum Barnard, ITT Co-ordinator, on shallumbarnard@brightonhill.hants.sch.uk.